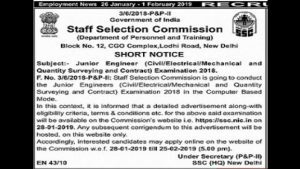 Staff Selection Commission (SSC) has published notification for Junior engineer vacancies. Interested & eligible candidates can read Notification & Apply online before the last date at https://ssc.nic.in. CBT Exam (GK, Quantitative Aptitude) 100 marks.